What is dark matter and dark energy and why is it speeding up the expansion of the universe? Why scientists think dark matter and dark energy exist. Dark matter is a form of matter that scientists hypothesis exist. Scientists Thought dark matter had to exist because when looking at galaxies the force of gravity should be less the farther away from the center of the galaxy the star is so the orbit speed around the galaxy should be considerably slower for a star near the outside of the galaxy but when looking at outer stars in galaxies they don’t go as slow as they should this suggests that there is something around the galaxy making the stars move faster. This didn’t seam correct, Newtons theory about gravity didn’t explain why the stars were moving that fast Instead of suggesting that newton was wrong they thought that the reason must be that there is a type of matter that does not emit or reflect light but still has mass and can pass through normal matter. It turns out there is and they called it dark matter. A way scientists can observe dark matter is by looking at light that is bent by the gravity of clusters of galaxies, by looking at how much the light around the cluster is bent they can tell how much mass a cluster has and where the mass is located when the mass is mapped out it shows that there is mass within the cluster that is emitting no light showing that there is dark matter. Scientists can tell the amount of dark matter differs depending on which galaxy scientists look at as well. The force that dark matter creates changes based on how much dark matter is present. Dark energy was hypothesized because the universe seemed to be expanding and a energy that is present throughout space could have been a possible reason why. Scientists think there is dark matter as well as some kind of energy that works in opposition to gravity or as its commonly known dark energy. 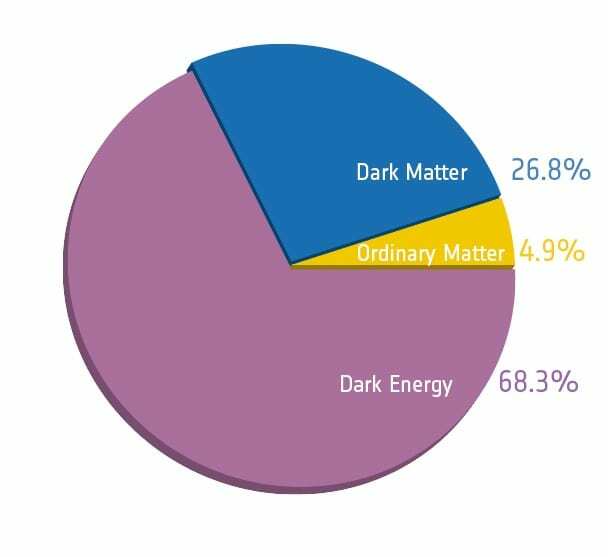 Scientists calculated that there should be about 5 times more dark matter than regular matter and about 14 times more dark energy. Dark matter is thought to possibly be particles called axions which don’t emit light but have mass and also are able to pass through normal matter however these particles are still hypothetical. What we know for sure about dark matter is that it it interacts with gravity like normal matter does and that it makes galaxies and other things stay together when they form. We also know there is a lot of it. Dark energy on the other hand has less known about it. Not all scientists agree on what it is but most do agree that it is constant throughout the universe. Some think that it is just a property of space expanding others think that it is a force that works in opposition to gravity. What do scientists think is speeding up the expansion of the universe? originally scientists thought because of gravity the universe would collapse back into itself. After realizing the universe was expanding more and more scientists didn’t and still don’t really know why it is. Some think its dark energy others just think its a property of space expanding and some think dark energy is particles popping in and out of existence. However whatever is speeding the expansion up has more energy than everything else in the universe. Are Dark Matter And Dark Energy The Same? I believe that what is causing the expansion of the universe and it speeding up is that empty space always has dark energy that does not get weaker as it expands (This Idea is also really well laid out in the third link in the resources section). The expansion of space is where I think the energy is coming from. As time continues the more space expands increasing the total dark energy making the universe expand quicker and quicker at an ever increasing rate. What is the best voting system?